Puthiya Thalaimurai, TV channel with its unbiased and independent news, delivering live News, as-it-happens, has dramatically re-defined television journalism in Tamil Nadu. Puthiya Thalaimurai has done what it promised to its viewers; that it would provide a platform to the voiceless and bring out the aspirations and beliefs of Generation Next. Every year the channel recognizes legends and eminent rising stars for their achievements, contribution to the country and to the society. The Channel will be honouring them with the prestigious Puthiyathaliamurai Tamilan awards. 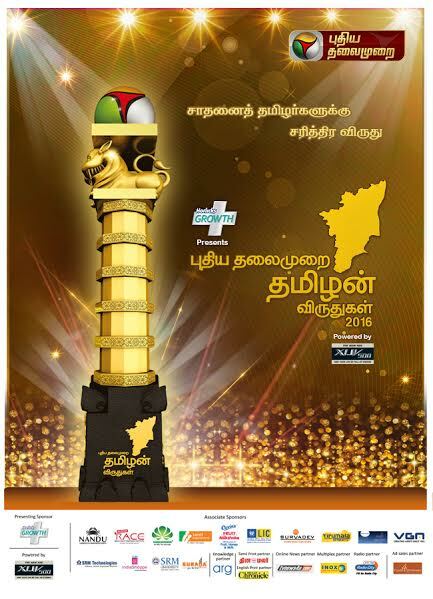 Puthiyathalaimurai TV is set to announce the Tamilan Awards for the year 2016 in grand mega event organized on 11th of August 2016 at 6.00 pm in Chennai Trade Centre. The award categories are given below. Each category has a two sub divisions under which an Eminent legend and a Promising Star will be recognized.